The birth of a crawler.. 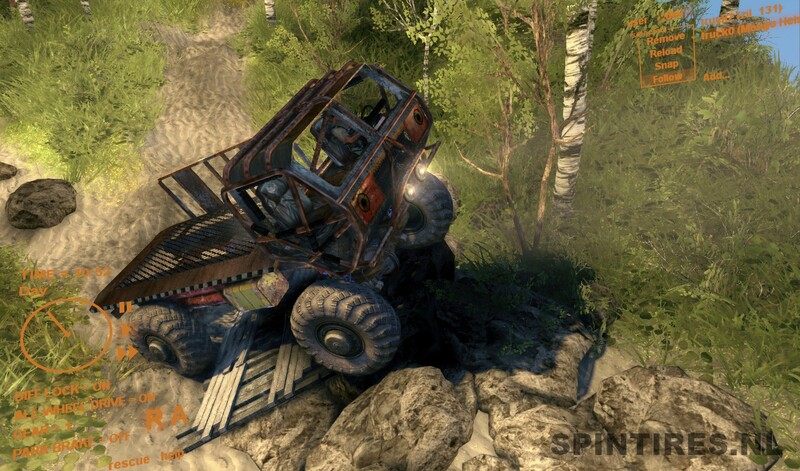 This is a how-to for transforming an ordinary truck into a rock crawler. 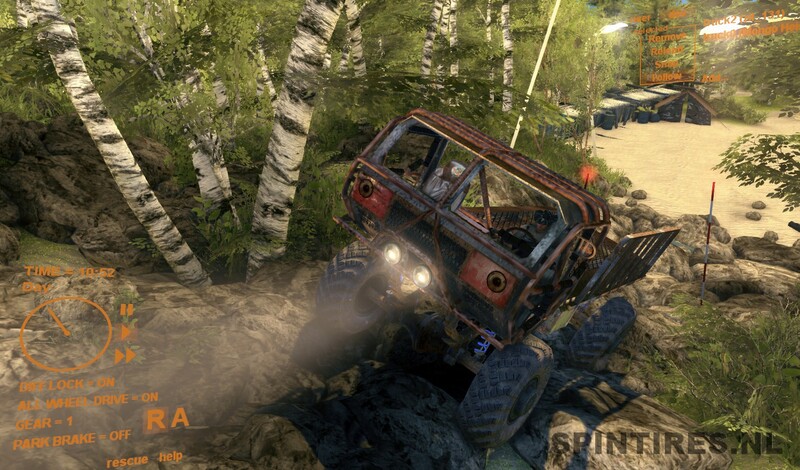 When you want to create a crawler truck out of a standard truck or car choose wisely. Don’t think you can pick a big 6×6 truck and convert it into a crawler. 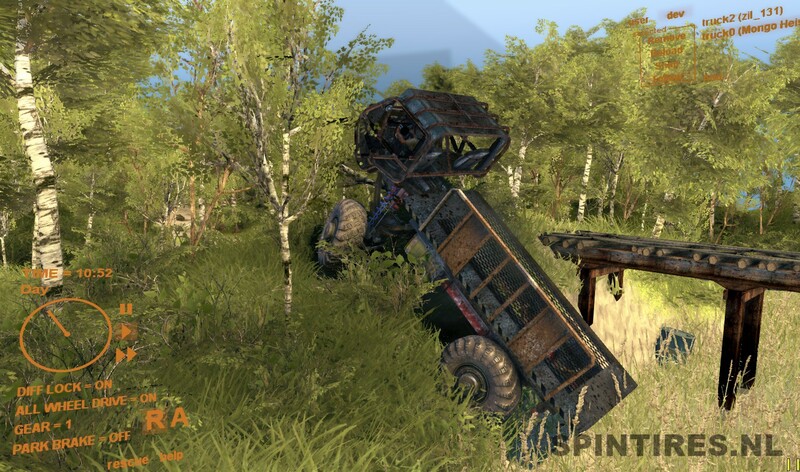 These trucks often are too stiff and do not have enough give in their suspension to facilitate the wheel traveling up and down. If you do pick a big truck make sure the suspension is with leaf springs or coils. That should give enough room for fitting bigger tires and it gives enough flex while crawling. 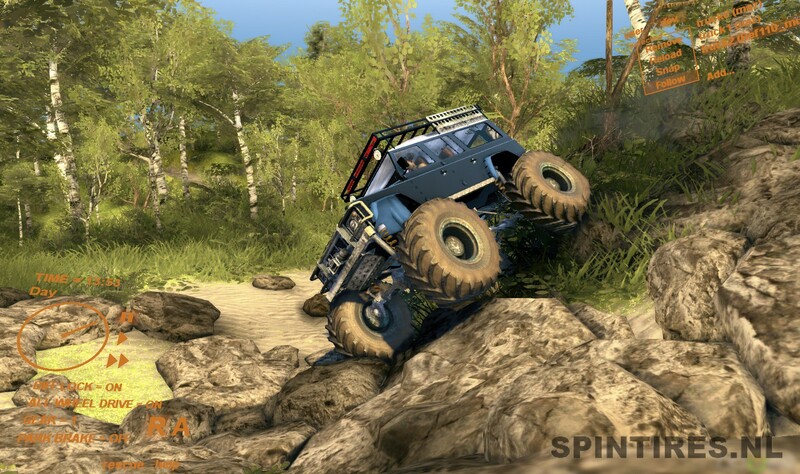 Rock crawling is all about getting enough grip at low speed so fitting your crawler with narrow tires is not going to perform good enough. What we are going to use are wide tires with lots of footprint. 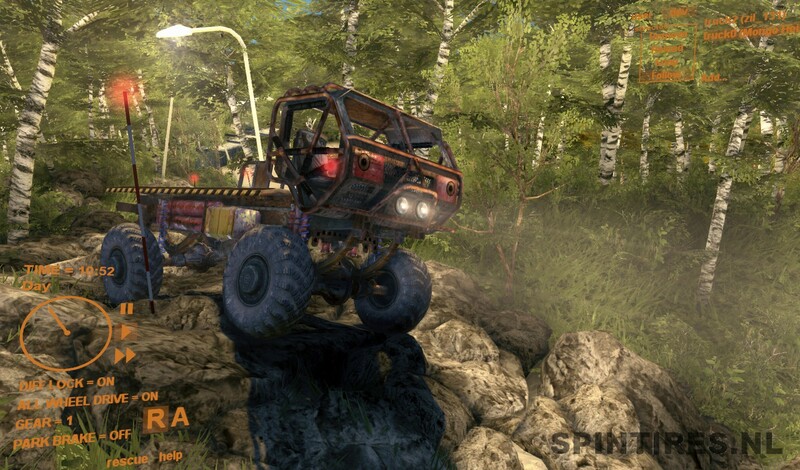 For instance the T-150 wheels,Monster truck,Maz or kraz wheels. And when you like to watch the car crawl over a rock make sure to choose tires that can deform. The process of fitting new wheels to your truck is simple. We borrow wheels from another truck. That donor truck also needs to be installed in the game or the transplant will fail. 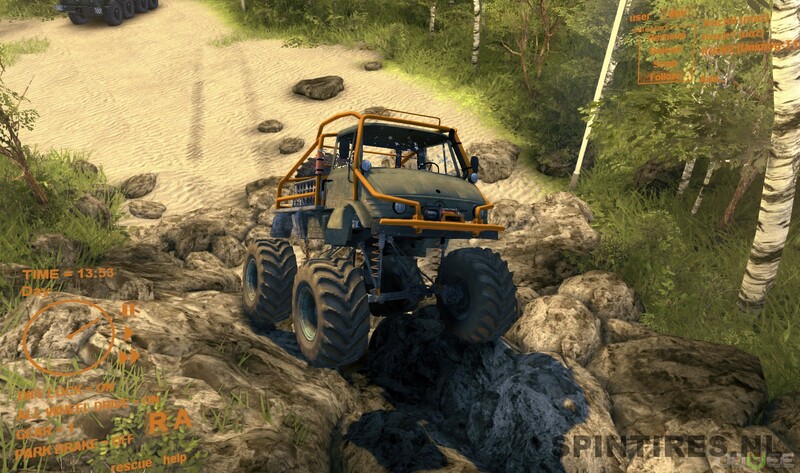 Mesh=”maz_wheel_left.xml” <——– This is where you can change the tire and put one on from another vehicle. TrackTexture=”kraz_track__d.tga” <—— This is the track that the tires leaves behind as you drive. Radius=”0.68″ <——-This changes the physical radius of the tire. Width=”0.52″ <——-This changes the physical width of the tire. Mass=”600″ <——-This is the weight of the tire. A heavy tire means the truck handles better. Friction=”6″ <——-This changes the friction of the tire on the ground when there is no mud. SubstanceFriction=”1″ <——-This is the friction of the tire in mud. SteeringAngle=”35″ <——-This is how much the wheel turns. a positive integer means it turns regularly, negative means opposite. p.s. By adding a high Friction number your car wil also brake really hard. Fitting new wheels to a truck is now done but when you load them they are in the wrong place on the axles. This is because your new tires have different dimensions then the original wheels. So we are now going to edit the wheel position. Open your new xml and scroll all the way down to the very end of the xml. You will see a Wheel section. The Suspension Hardpoint is the part we are going to change. You see three numbers. The first is the position of the wheel from the center of the truck. The second number is the ride height. And the third number is the position of the wheel from the center of the axle. Adjusted the ride heigt a bit and the placement on the axles. The position of the wheels from the centre of truck remains untouched. This is a bit personal as it is different for everybody what they prefer the suspension to be like. Hard or soft? The following block of code is the one you can tinker with to determine how your suspension will react. Strength=”0.005″ <——- The strength of the suspension, lower the number, the weaker it is. Damping=”0.18″ <——- The “bounciness” of the suspension. <Steering JointOffset=”0.1″ Castor=”8″ /> <—— this doesnt really matter unless your making a mod from scratch. <Softness ForceScale=”1.0″ MaxAccel=”0.5″ /> <——- This is how soft the tires are, if made correctly the deform. 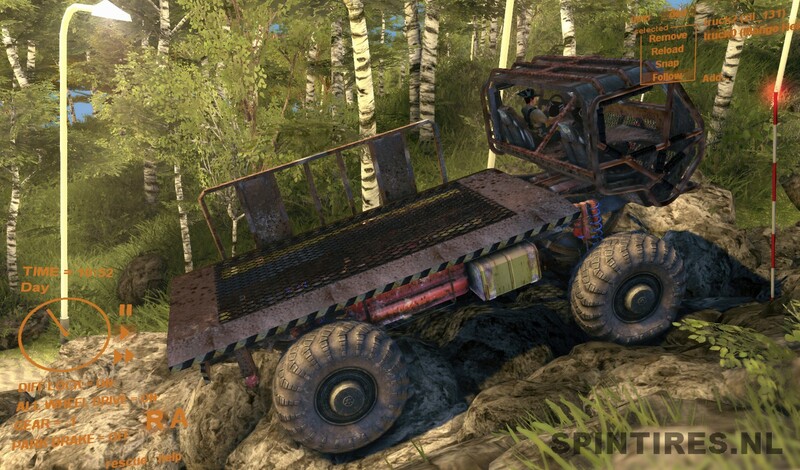 For my example truck, the Mongo Heist Maz crawler, I copied the suspension settings from the Hilux Truggy. Center of mass is what it is. It determines where your truck has it center of mass. Put it too high and the truck tips over really easy. Set it to low and it becomes more rigid then nescesary. Open the xml of your truck and search for CenterOfMassOffset. The numbers behind this determine where your truck will have its center of mass. This is a choice everyone can make for themselves so play around with these numbers and see for yourself. 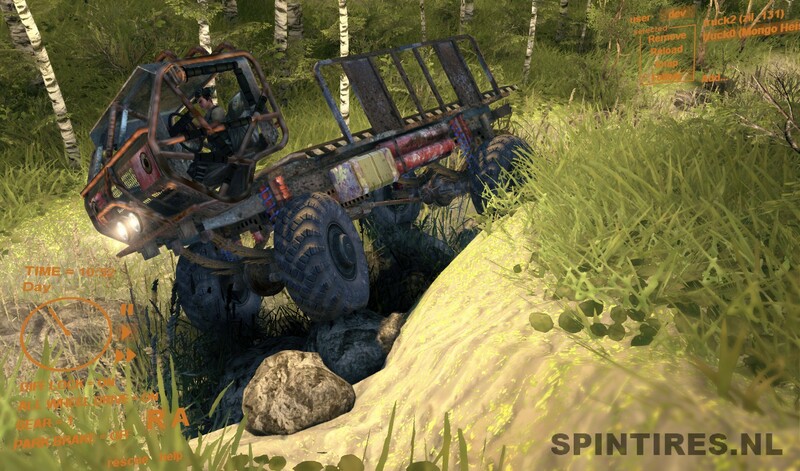 I copied the CenterOfMassOffset from the Hilux Truggy which works really good on the tweaked Mongo truck. The numbers are in three sets. The first determines the location of the CoM from the center of the truck forward or back. The second set determines the up or down from the center of the truck. The third set determines left or right from the center of the truck. 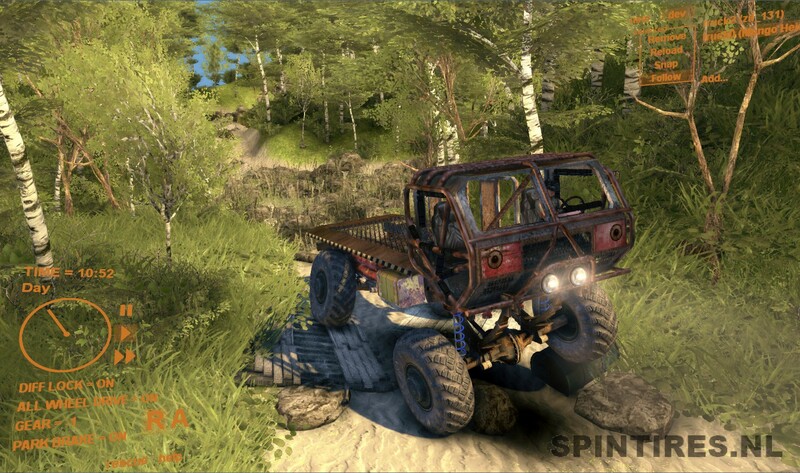 Now you have a truck with slightly larger wheels for better grip but the truck can not get grip because it wants to accelerate to fast which results in loosing grip instead of getting it. So we have to adjust the gear setup as wel. 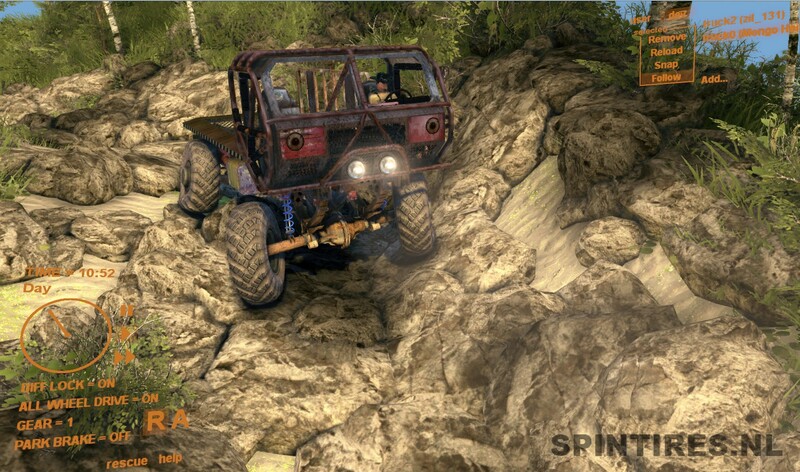 For this I always use the gears as setup by Rhys Trappet in his Hilux Truggy car, they provide maximum torque in gear 1 and 2 which results in a lot of grip when crawling over rocks. Torque=”100000″ <—–The amount of power the truck has. MaxDeltaAngVel=”0.1″ <—–This is how fast the torque gets to the wheels. I hope you found this tutorial usefull. Thanks to Bardaff for tips and advice. p.s. Should you find a error in this tutorial do not hesitate to contact me. Cool!tx for this great tutorial guys! 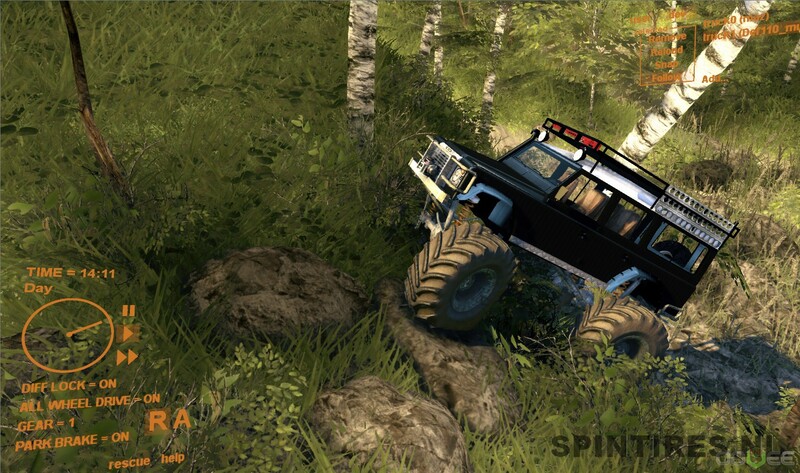 I simply wanted to make the tires on the FJ Cruiser a bit bigger. I made the numbers bigger, and then saved the xml file then went back into the game. nothing changed. Help Please. 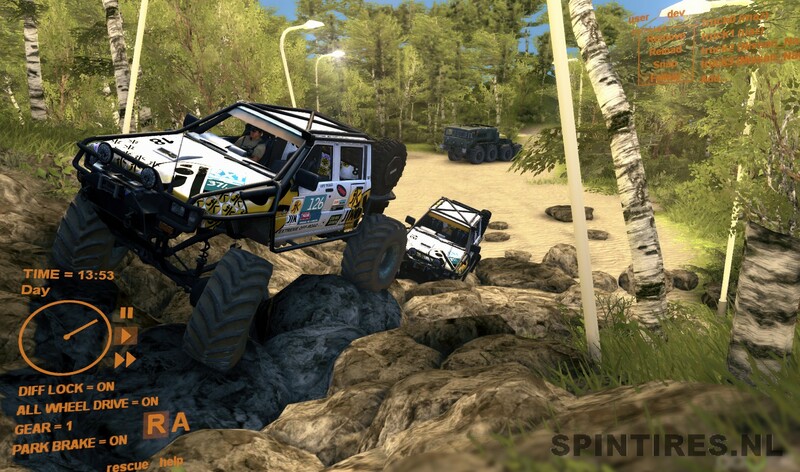 The xml only does things like the weight of the tire and its grip etc. To make the actual displayed tire bigger you would need to edit the texture files of the tire.